"Mi Shebeyrach :: The Well Within"
The inspiration for “The Well Within” comes from the beautiful and heartfelt prayer “Mi Shebeirach”. The words of this inspiring prayer invoke a plea to G-d for the healing and health of loved ones or friends who may be suffering from physical ailments or illness. 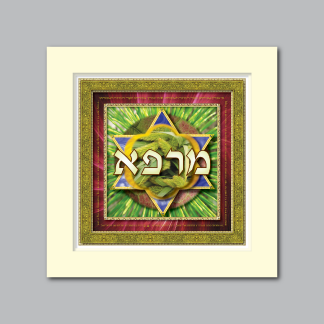 Within a gilded frame rests an ethereal and radiating ruby background upon which the golden words of the Mi Shebeirach prayer float. The central frame of this art piece encloses lush green vegetation that symbolizes health and healing. As with the ruby background, the bright green pine needles seem to undulate and radiate toward the very heart of this art piece, seeming to act as a conduit of healing energy. 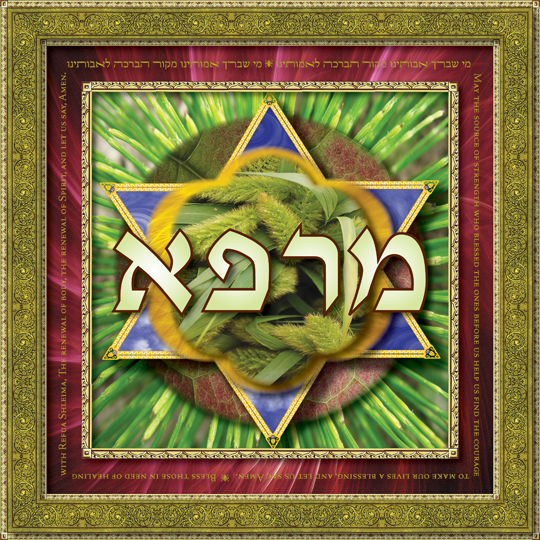 The circular image residing behind the “Mogen David” or “Star of David”, represents the skin-like texture of a vibrant and healthy leaf. The Mogen David, symbol of the spiritual aspect of direct healing from G-d, is filled with celestial blue ether and edged in gold. In the very center are verdant wild plants that seem almost to burst out of the art piece, full of life and vitality. 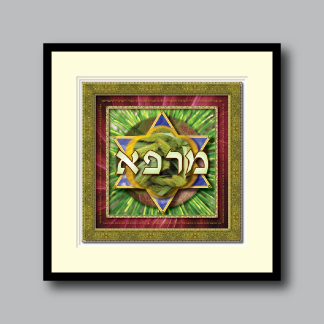 The Hebrew word featured prominently in the middle of the design means “healing”. It presents the primary concept for the entire image. Its lesson is this: it is the power within ourselves in partnership with G-d that heals every part of our lives, be it physical, mental, emotional or spiritual.